While acknowledging the fury over problems with the new GPS ground system, the head of Air Force Space Command told lawmakers this month that finishing the program with the current contractor was the best way forward. That contactor, Raytheon, is years behind on the Next Generation Operational Control System (OCX), a project whose price tag may now top $4 billion. 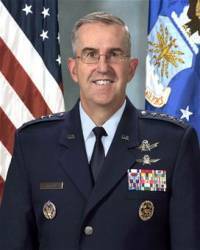 "I’ve been on the record expressing my displeasure over the OCX program," Gen. John Hyten, the commander of Air Force Space Command told the House Subcommittee on Strategic Forces on March 15. "I called it a disaster in the press — I think any program that is $1 billion over budget and five years late meets the definition of disaster. But the question we have to ask ourselves is ‘What is the best way forward?’ ‘What is the best way out of this?’"
The program is being closely monitored, Hyten said, and has been through two "Deep Dive" reviews before Frank Kendall, the under secretary of defense for acquisition, technology, and logistics, who has gone through the details and looked at various options. 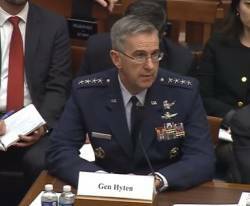 "As we sit here today," Hyten told lawmakers, "the best answer is for Raytheon, the contractor involved, to deliver that capability in a time-certain manner and give us the capability that we need to make sure that GPS is available for future years and in a cyber secure environment." Dyke Weatherington, the acting deputy assistant secretary of defense for space, strategic, and intelligence systems, confirmed that view. "We believe there is reasonable expectation that Raytheon can deliver the capability that we need," Weatherington told lawmakers. Weatherington added that the Air Force has prepared "off ramps" should OCX again run aground — and the program’s problems appear far from being resolved. After the Deep Dive in December, Kendall gave Raytheon another two years with the proviso that they deliver as promised and go through similar detailed reviews quarterly. Kendall told Inside GNSS before the early March Deep Dive that he would be tracking Raytheon’s progress and, if they were not executing as promised, he’d "look at, at least, a partial cancellation." The most recent Deep Dive review took place on March 8. A report released the next day by the Government Accountability Office (GAO) said that some Department of Defense (DoD) officials believe the program could realistically need another two years beyond that granted by Kendall before the first increment of the OCX ground system could be delivered — possibly amounting to a cumulative six-year delay in the original schedule. Whatever the outcome of Raytheon’s efforts, Weatherington said, the new GPS ground system is essential. "I think it’s also important to point out," he said, "that while the program is troubled, the capability that OCX delivers is absolutely critical to the war fighter. We’ve got to improve our resiliency both in space and in ground — and that was one of the significant goals that OCX had. Whatever we do for that program specifically, we have to deliver that capability for the war fighter." At the subcommittee hearing, lawmakers asked about other issues affecting the GPS program, including the budgetary ramifications of switching space launch vehicles. Sen. John McCain (R-Arizona) who chairs the U.S. Senate Armed Services Committee, is pushing hard for the United States to stop using the Russian-made RD-180 rocket engine. The heavy-lift Atlas V rocket, which lifts some GPS satellites into orbit, currently relies on the engine; so, satellites scheduled for launch on the Atlas would have to be shifted to other launch vehicles, affecting schedules and triggering expensive reconfigurations to the launchers. "Some have suggested we should phase out Atlas V and go to a Delta IV and Falcon 9 mix prior to a new U.S. engine being built," said subcommittee Chairman Mike Rogers (R-Alabama). He noted that Secretary of the Air Force Deborah Lee James had told the Senate Armed Services Committee that it would cost $1.5 to $5 billion depending on the timing of the transition. "If this cost had to be taken out of existing space accounts," Rogers asked Hyten, “what would be the impact on the existing Air Force Space mission?" "The impact on the existing Air Force space mission would be significant," Hyten said. "What do you take out? Are we going to stop doing GPS? Are we going to stop doing missile warning? 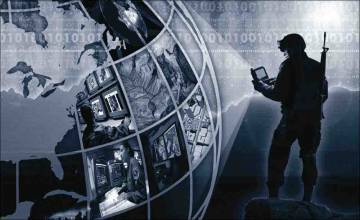 Are we going to stop doing satellite communications? Those are very, very difficult questions." Rogers also asked about efforts by the firm Ligado Networks (formerly LightSquared) to reenergize a proposal to operate a wireless broadband network in spectrum near that used by the GPS system. Testing in 2011 showed that the company’s original plan would overload all manner of GPS receivers. As a result of the testing outcomes, in 2012 the Federal Communications Commission (FCC) withdrew the conditional approval it had given the firm earlier and LightSquared filed bankruptcy soon after. The company has since reconstituted itself and is now pursuing a modified plan. "I’m concerned," said Rogers, "about the loss or transfer of spectrum and the impact on national security, particularly when I hear the chairman of the FCC telling the satellite industry that ‘it’s more practical to get on the train than be run over by it.’"
FCC Chairman Tom Wheeler, who was referring to a bruising fight over the Ka-band of frequencies, made that remark in a speech at the Satellite Industry Association’s 19th Annual Satellite Leadership Dinner. GPS operates in the L-band, although the fight between the navigation community and Ligado was also intense. The firm has agreed to forego using the frequencies closest to GPS, and modified other aspects of its plan including reducing signal power. "You may recall that your predecessor Gen. Shelton testified pretty much from where you’re sitting right now, said Rogers. "[He] warned that a proposal under consideration by the FCC would have created extensive, harmful interference to GPS." Hyten said he has yet to see data indicating the changes to Ligado’s proposal would make the plan workable.
" I’ve heard that Ligado has put forth a new proposal to use that spectrum, but I’ll tell you Congressman I have seen no data that supports the use of the frequency spectrum other than the data I saw in 2011," Hyten said. "So, the position of Air Force Space Command is the same as it was when Gen. Shelton sat in that seat. I don’t think that we should infringe on the GPS spectrum. That’s a critical capability not just for the military security of the nation but for the entire economic well-being of this nation. We can’t allow that to happen." Hyten noted that the Air Force is supporting the GPS Adjacent Band Compatibility Assessment being conducted by the Department of Transportation. Detailed testing, he said, would start in April and be followed by a peer-review of the results in May and June. "We’re trying to be good partners as we work at that," Hyten told the subcommittee, "but the partnership has to be based on real testing, real impacts and what the impacts to national security are. We cannot do something that will infringe on our national security. Period."